In the years since the team’s Division 1 Championship, Karen and the crew have had more downs than ups, but after some serious data review over the off-season, there may be more ups than downs. Starting the season, Karen and the A.A. Auto Salvage A/Fuel dragster traveled to the 4-Wide Nationals at zMax Dragway in North Carolina. Karen posted career best numbers, running 5.27 at 267 miles per hour to qualify 3rd out of over 20 dragsters. The gang posted a first round win against Mike Burns, running 5.35. Although Karen smoked the tires next to Jake Allen, an eventual finalist, the team was very satisfied with the results. Next up was Virginia Motorsports Park for the Lucas Oil Drag Racing Series Regional Event, where Karen Qualified 6th, but was unable to return after the race was rain postponed, due to her son’s 1st Communion. Karen and team later traveled to Maple Grove Raceway for their next East Region competiton. Going to Maple Grove, the team was a little worried with the very large car count and some very fast cars entering the event. Once again, the team found some success, running 5.38 at 267 miles per hour to qualify 6th for the 8 car field out of an impressive 20 cars on the property. Karen ran 5.38 again in round 1 to defeat Wayne Morris, however Karen fell short in the semi-finals against Duane Shields when the car carried the front end a little too high causing Karen not to be able to steer and had to shut down. The wheelstand was caused by a weight problem, which has since been corrected, and the team was encouraged knowing early numbers show the car was on a great run. With several weeks off between NHRA events, the team had some fun at the Atco Dragway Thrill Show on June 13. The crowd was amazing with many nostalgia funny cars and jet cars, pro mods and Harleys. Karen and Frank Shuster, driving the Tom Jones Supercharged Top Alcohol Dragster (formerly driven by Karen) made a few exhibition passes for the crowd. Karen and Frank had some great side by side racing on a hot evening, with the first pass going to Karen running 5.38 over Frank’s 5.44 and the second run going to Karen by .009 seconds with a 5.45 over Frank’s 5.55. Sunday followed up with Karen and team staying to test some clutch changes, and they slowed to 5.54 but still were satisfied with the car continuing to go down the track. Karen’s son Paul even got in on the action, running his Jr Dragster in the Sunday Jr race. Paul lost first round, but he is driving great, it’s his Parents that have to get the car slowed down with some weight and to get it more consistent for him! Next stop for Karen and the A.A. Auto Dragster team is Lebanon Valley, NY for the Lucas Oil Regional Event. Hope to see you at a future event! Remember to stop by for some ladies t-shirts, quantities and sizes are limited. Special Thanks to Bruce Insinger at Insinger Performance Fuels and Ernie Kendall at MX Industrial for their terrific support and friendship. Also, thank you to NGK Spark Plugs, Lucas Oil Products and Mahle Aftermarket for continuing to believe in Karen and her team. We hope to make you all proud! After several years of performance struggles and ups and downs, Karen Stalba and her crew/family are looking to continue with the performance success they found towards the end of the 2014 season. Due to many things happening on the homefront and the performance struggles, Karen only attended a handful of races in 2014, instead opting to stay closer to home and try to sort out her A/Fuel Dragster’s tune-up. The team feels that after much testing at home track Atco Dragway, and the consistency they found at the Atco Lucas Oil Divisional race in August, they have a great baseline for their tune-up and finally have more of an understanding of what the motor needs. It has not been an easy road, but the team feels that as they gain the knowledge on their own, they can build on it and have the information for themselves. Experience will hopefully start to pay off in the 2015 season. Karen and her team plan to start the season in Charlotte and the NHRA 4-Wide Nationals March 27th-30th, then at Virginia Motorsports Park for the Lucas Oil Divisional Points race April 24th-25th. 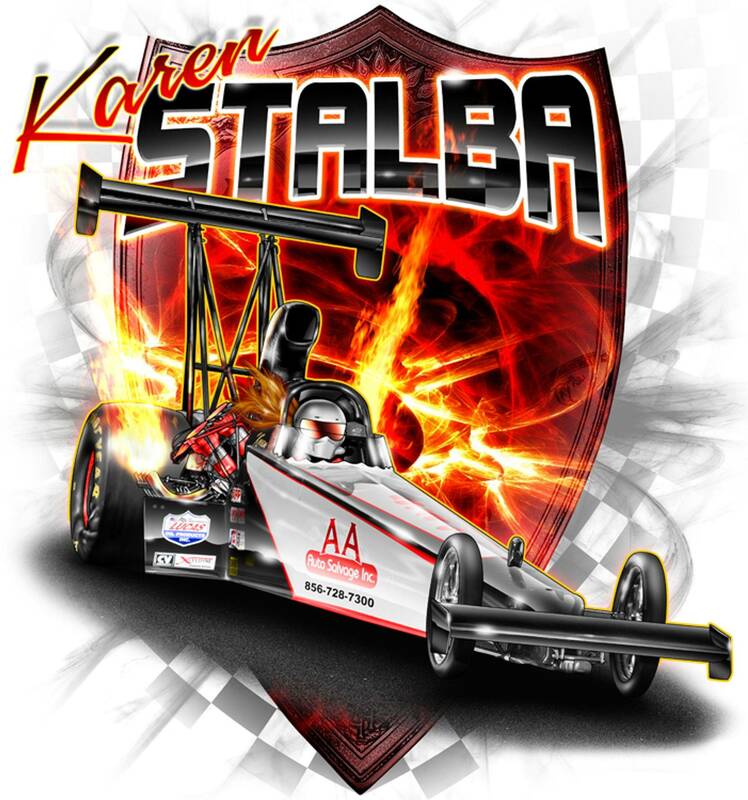 A full schedule will be available on the website www.karenstalba.com and also at Stalba Motorsports on Facebook. Follow along with Karen on Twitter @karenstalba for latest news and weekend updates. Karen would like to thank Lucas Oil Products and NGK Spark Plugs for continuing their support and hopes to make them proud this year. Karen would also like to thank Mahle Aftermarket for continued product support. Check out their Facebook page or website for informative videos on their products and how to use them in your application. Karen also thanks A.A. Auto Salvage for providing her primary support and encouragement. You can check them out at A.A. Auto Salvage on Facebook and at www.aaautosalvagenj.com.